1 Place the chocolate in a bowl and add 270ml of hot water. Using a whisk, mix until the chocolate has dissolved. 2 Place the bowl over an iced water bath and whisk until the mixture begins to thicken. 3 Remove the bowl from the iced water bath and continue whisking until the mixture just becoming soft set. Serve immediately. 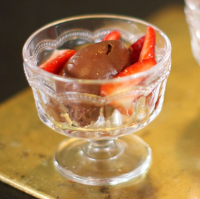 If the mousse becomes too set, just sit it over a bain marie for a few seconds to loosen it up.